Perhaps now that I am living in Sanctuary surrounded by two rivers, which envelop us on three sides, I will get back to my Waters of Life book and finally finish it. Here we are reminded every day the importance of water and what it’s like to drink it as it comes out the top of a mountain. We do have a village water system for our little valley of perhaps 70 simple homes but it is for collection and no treatment is done. There is something I found with our drinking water that makes an interesting lesson about alkalinity and pH. I tested our water and to my dismay it was slightly acid but putting only a pinch of sodium bicarbonate into a half gallon moved it powerfully to the alkaline. There is some confusion between alkalinity and pH. It seems that it is not enough to drink high pH water. Alkalinity also needs to be high for the high pH water to have a strong medical affect. or buffers against rapid pH changes. Alkalinity and pH are related to each other in ways that are obvious, and in other ways that are subtle. The idea that alkalinity is separate from pH (which is by ‘coincidence’ called either acid or alkaline) is a myth though pH and alkalinity are two different measurable parameters of water. Even though the pH can be very high we find that un-mineralized water has little ability to neutralize acid in the stomach to initiate the production of bicarbonate in the bloodstream. water - its ability to resist sudden changes in pH. 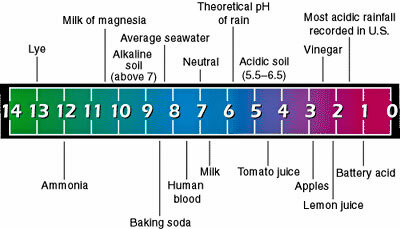 pH is a measure of how acidic or basic water is. 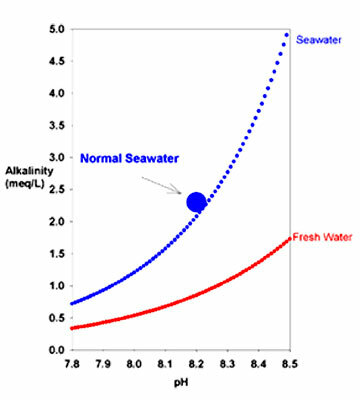 Alkalinity is the water’s capacity to resist changes in pH that would make the water more acidic. This capacity is commonly known as “buffering capacity.” For example, if you add the same weak acid solution to two vials of water - both with a pH of 7, but one with no buffering power (e.g. zero alkalinity) and the other with buffering power (e.g. an alkalinity of 50 mg/l) - the pH of the zero alkalinity water will immediately drop while the pH of the buffered water will change very little or not at all. pH simply expresses the degree of hydrogen ion concentration. (OH-1) ions. It is measured in mg/l or ppm as CaCO3. Alkalinity of natural water is determined by the soil and bedrock through which it passes. The main sources for natural alkalinity are rocks which contain carbonate, bicarbonate, and hydroxide compounds. Borates, silicates, and phosphates also may contribute to alkalinity. Limestone is rich in carbonates, so waters flowing through limestone regions or bedrock containing carbonates generally have high alkalinity - hence good buffering capacity. Conversely, areas rich in granites and some conglomerates and sandstones may have low alkalinity and therefore poor buffering capacity. this one can only wonder what it does to human innards. Alkalinity is a measure of the capacity of water to neutralize acids. It measures the presence of carbon dioxide, bicarbonate, carbonate, and hydroxide ions that are naturally present in water. At normal drinking water pH levels, bicarbonate, and carbonate are the main contributors to alkalinity. 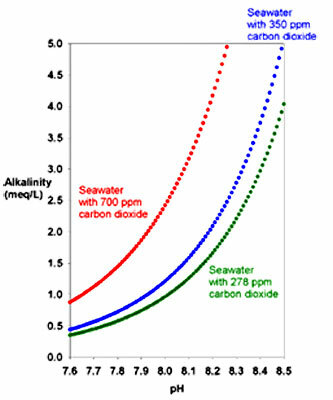 As we can see in the below graph the higher the CO2 the more alkaline the water at a given pH. In the chemistry of natural waters, there are several types of alkalinity that are encountered. Each of these is a measure of how much acid (H+) is required to lower the pH to a specific level. The reason that aquarists measure alkalinity is that in normal seawater, most alkalinity consists of bicarbonate and carbonate. Consequently, alkalinity is an indication of whether or not adequate bicarbonate is present in the water. Sodium bicarbonate is the main alkaline buffer in our blood. in a net gain of alkalinity in our body. The main chemical species that contribute to alkalinity in seawater are bicarbonate and carbonate. The table below (from “Chemical Oceanography” by Frank Millero; 1996) shows the contribution to alkalinity from the major contributors in seawater at pH 8. Carbon dioxide has a specific solubility in water as carbonic acid (H2CO3). At any given pH there is an exact mathematical relationship between H2CO3 and both bicarbonate and carbonate. For example, at a pH of about 9.3 in freshwater (about 8.4 in seawater) the carbonate concentration is 100 times that of the carbonic acid. At higher pH this multiplier rises, and there is consequently more bicarbonate and carbonate present. becomes an appreciable concentration of carbonate. freshwater (red) equilibrated with the atmosphere (350 ppm carbon dioxide). Normal to high alkalinity implies adequate bicarbonate, while low alkalinity implies that it is in short supply. Bicarbonated water is the healthiest water to drink and that is made clear in my Sodium Bicarbonate book. It is critical to see that alkalinity does not depend strictly on pH though. There is a relationship between the two but pH measures the degree of alkalinity but not its quantity. It is like the relationship between temperature and heat. You can have a paper clip heated to 10,000 degrees but it will not heat a house nearly as well as 90-degree air blown from a home heater. equivalent concentration of calcium carbonate (CaCO3). Alkaline ionizers do not always deliver water that is sufficiently acid-neutralizing to make a difference. Alkaline ionizer promoters equate acid-neutralizing ability with high pH. From the discussion above we can see that it is the parameter of alkalinity that neutralizes acid, not pH levels alone. In other words you can have high pH and little alkalinity and you can have low pH and a lot of alkalinity (e.g. sparkling mineral water). If there is only a small amount of alkaline elements (from the first two columns of the Periodic Chart) an ionizer will generate a meager quantity of acid neutralizing alkalinity - but the pH will still show as a high alkaline value (e.g. 8.5 to 10.5). contribute carbonate ions to the buffering system. People living in low mineral areas (many city supplies and wells) think they are getting a good dose of alkalinity from their ionizers when they would be much better off with 1/2 tsp. of baking soda or a shot glass of Gerolsteiner Sparkling Water. So it will be advised for many users of water ionizers to add sodium bicarbonate to their water if they are looking for stronger healing effects. have hundreds of times more acid-neutralizing "alkalinity"
than water with an alkaline pH of 9.5 from an alkaline-ionizer. The shortcoming of ionizers is simply that the input water chemistry determines its degree of benefit in terms of acid-neutralizing alkalinity (not pH!) and negative ORP (active hydrogen). The quality of one’s “raw” water resource has to have a lot to do with our decision in terms of filters and ionizers chosen. Most practitioners promote the idea that alkaline pH implies significant acid-neutralizing capacity - but that is not always correct. There are good reasons to suggest that those who have ionizer machines should add extra alkalinity (bicarbonate) - if the mineral content of their water supply is low. When the source water is low in minerals (most public drinking waters are low in minerals especially magnesium and bicarbonate) re-mineralization becomes critical. “In order to digest food and kill the kinds of bacteria and viruses that come with the food, the inside of our stomach is acidic. The stomach pH value is maintained at around 4. When we eat food and drink water, especially alkaline water, the pH value inside the stomach goes up. When this happens, there is a feedback mechanism in our stomach to detect this and commands the stomach wall to secrete more hydrochloric acid into the stomach to bring the pH value back to 4. As we can see from the above chemical equations the byproduct of making hydrochloric acid is sodium bicarbonate (NaHCO3) or potassium bicarbonate (KHCO3). The bottom line is that a net gain of alkalinity is achieved in the body and this is extremely helpful in a body struggling to maintain equilibrium.